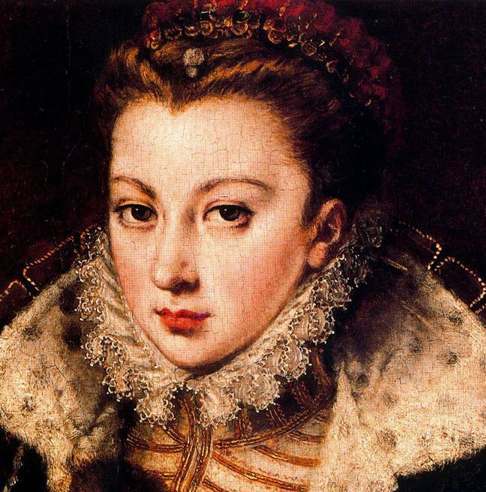 Elizabeth de Valois’ marriage to King Philip II of Spain took place by proxy in France in the summer of 1559. It would be another four months before she departed France to take up her duties as Queen in Spain. This was due in part because her mother, Queen Catherine de’Medici demanded that she name and appoint each and every one of Elizabeth’s servants. Of course, her husband wanted her servants to be Spanish so this would lead to a great deal of conflict. Once Elizabeth crossed the border into Spain, her new servants were added and the fighting started. At the age of fourteen, Elizabeth was too young to maintain control of her household and the infighting made her situation that much worse. It wasn’t long before Philip insisted that some of the French servants be dismissed and sent home. But even after this, bickering continued for many years. In early 1566, there was an ongoing feud between the French and Spanish physicians in Elizabeth’s household. The belligerents were Maîtres Vincent, Monguyon and Burgensis on the French side and Olivarez and Gutierrez on the Spanish side. Because Elizabeth’s health was delicate, there was ample opportunity for angry debate. The Spanish doctors were mostly of the Sangrado school and were jealous when Elizabeth showed an obvious preference for the prescriptions of her countrymen. The French doctors would stigmatize and irritate their counterparts by calling them names. One day, when King Philip was away from court, Elizabeth informed Dr. Vincent of her desire to take a bath prepared with certain medicated waters according to a recipe recommended by her mother. Dr. Vincent agreed there was no harm in her request and gave the necessary directions to his apothecary to prepare the bath. Elizabeth told her primary lady-in-waiting the condesa de Urueña she intended to take this bath. The condesa solemnly inquired of the queen if the bath had been approved by the entire medical staff and Elizabeth replied that Dr. Vincent alone had been consulted. The condesa left the queen in a great state of excitement and summoned Elizabeth’s mayor-domo Don Juan Manrique to tell him the queen was about to bathe in medicated waters solely on the recommendation and authority of Dr. Vincent and none of her majesty’s other physicians had been consulted. Consequently, Don Juan Manrique prohibited Dr. Vincent and his apothecary from preparing any bath for Elizabeth or to administer any potion or “…to touch a single hair of her head” without consulting the Spanish physicians. He further specified the physicians could no longer do any more treatments unless they submitted their opinions to him first for his approval. Dr. Vincent was compelled to make his excuses to the queen as best he could and because Philip was away, Elizabeth could not overturn her mayor-domo’s decision. Two days later, the queen sat at dinner eating some black puddings (blood sausages) which was considered a very royal dish. The next morning, Elizabeth complained of feeling indisposed and having a headache. The physicians were all summoned but Dr. Vincent purposely left the case as far as possible in the hands of the Spanish doctors. Perplexed with the great amount of responsibility thrust upon them, they requested the cooperation of their French colleagues. Dr. Vincent gravely submitted the recipe for the medicated bath and stated it was the only remedy he knew of to treat her majesty’s condition. The bath was unanimously approved as the most acceptable remedy. Don Juan Manrique withdrew his veto to the great satisfaction of Queen Elizabeth. Having been betrayed in the matter once by the condesa de Urueña, Elizabeth never mentioned her intentions to her lady-in-waiting again and frequently availed herself of the luxury of a bath whenever she pleased. All Catherine’s children were good-looking while their mother was not an attractive woman. Thanks, that was amusing! Of course the incident is completely farcical, but it does show I think how being a queen in that era was probably more often constraining than fun. Like some doctors today, the two doctors put their egos before the patient’s welfare. It was a fun article to read. I could just imagine the squabbling that went on. Love your description of the rival medical teams as “the belligerents.” Hope Eliz. replaced her major-domo as soon as she found her sea legs at the court of Spain. A charming article with your permission I translate it for its diffusion in the group that I administer The black pudding, blood sausage ( in spanish “morcilla” ) is delicious but very indigestible. Of course karldevire! Just be sure to post a link to the blog. I guess she was lucky they didn’t decide to bleed her on this occasion. That seemed to be considered a cure-all. I’m glad she got her baths! Wow, —– just, —– wow! Wonder if it was the bath, or the medications, that upset the Spanish physicians? With the recent Muslim history of Spain, and its emphasis on cleanliness, the bath itself seems too innocuous.